AFAIK you won't be able to get it alone, KK only do installs, doesn't sell DIY kits. This one you can get as a kit. Install is similar to nitro's board, solder sense, pass it through, solder the rest. Worth noting that this board uses USB for backlight control instead of mirroring. There is an app for windows on 51nb (pm me for a google drive link) and I made this crude wrapper for linux. +1 for superbuy. BTW I am from Europe. Last edited by carcuevas on Fri Jan 04, 2019 4:42 am, edited 1 time in total. I traded a couple of emails with Pavel (nitrocaster) a couple of months ago. It seems he's trying to set up an Amazon store, but is having a hard time with things so he's not been following through with Google Forms orders. He said he'll updated the OP as soon as there's any update on that. I've been lurking here for quite a while debating whether or not this is worth it for me. I will be rebuilding my X230 almost entirely next summer, with 16GB RAM, an i7 motherboard, new battery, keyboard, chassis, etc. too. So, during that upgrade, I was hoping to bite the bullet and run the Nitrocaster FHD mod on it, since I will have it all opened up and everything. My question to everyone is, what display are you all using? I would really appreciate a recommendation, I don't have too much cash to spend, as the other replacements and upgrades are extremely expensive for me as a student. Nice to see that your on this forum! i figured out, he remove the wrong resistor on the board. checked the board, an was the R459 (placed in the "hole" of nitrocasters pcb). know anybody, where i can find these type of information? Labeled 0R2J-2, should be a 0402 size, 0 ohm resistor. You could replace it with a wire, but it shouldn't be too hard to find a replacement if you have an old dead laptop motherboard around. But you'd almost need a microscope to replace that sucker! so i think, i will place a wire as "short"
Is there anyone in North America who could do the panel swap and soldering of the board for me? I have the x230 and the board from Nitrocaster as well as a display panel. If so please send me a PM with the price and where you are located. I really appreciate it! What's the current status of a patched Coreboot on the X220? On the X230 I read some success stories, but nothing about the X220? A long promised store is here: nitrocaster.me/store. Hopefully this will make both buying for you and shipping for me easier! Please note that there may be delays with shipping because I'll be using a completely different process - but eventually it will get fast and smooth. For Russian buyers: PayPal не разрешает валютные переводы между резидентами РФ, поэтому переключайте валюту в рубли! Let me know (here or by email) if you have any problem placing the order and paying for it. I looked on Win0win for a BOE NV125FHM-N62 but their eBay ad says they may ship a LP125WF4 SPB1 instead! Is the LP125WF4 SPB1 compatible? Also, are there any screen with a colour gamut higher than 50% ? LP125WF2-SPB1 is not compatible. You have to ask the seller for the exact model. That's how it works. To my knowledge, screens with >50% color gamut are not available. I wouldnt get the BOE model anyway! read back a page. Theres another user and myself that have problems with the screen not always coming on. Mine doesn't come on when I boot up my x220, so I have to log in when I hear the sound and then Fn-F4 to put it to sleep and then wake it up and the screen comes on. If my screen turns off to save power or whatever I have the same problem. No one has commented with any ideas so I would say, steer clear of BOE. If you read through the comments, a lot of the delay has to do with finding different people to test it. Given how close the x220 and x230 are, after the all of the quirks with the x230 FHD have been worked out, I would reach out to Angel Pons and ask for the same changes to be made to the x220 if you are willing to test it. Nice. I see there is a rev 6 but can't find what is new about it. You may also want to bump the rev version in the instruction manual. The kit is in stock again. More will be available by the end of February, after I get new eDP cables. Well, despite the embarrassment I'll share my experience incase it saves someone else the same error! I'm reasonably competent with this kind of work and have most of the right tools etc. I got my kit today, for my X230 and decided to get started on it right away. I did all the soldering jobs, almost perfectly, and right first time. Fitted everything in, and loosely connected everything for a test. Booted up, and it all worked fine. I was quite impressed with myself. Also took the opportunity to install a new quite fan. Popped everything together and once it was back together.. started up.. Nothing, blank screen.. darn! I tried a few things, and I was convinced the sense wire joint was not right, so tried to fix it 'through the hole' which isn't the best idea, but it went ok. Anyway, long story short, after so much re-plugging, re-trying, re-soldering.. I've pretty much killed the board and some solder pads (wont boot) (I even slipped and knocked out some surface mount resistors.. probably due to tiredness / frustration!) and possibly the mod (Managed to salvage it / desolder it well, but not sure how easy it will be to re-use. The ribbon connector is a little broken despite being delicate with lots of re-plugs! So.. What happened... Well, one single god-darn thing I didnt check.. The screen model number, they sent me a NV125FHM-N62 instead of the model I requested.. despite noting the actual model in my sale. I never checked it after arrival.. this ones the screen that only seems to work upon waking from sleep.. somehow it worked the first time I tested it, and not after. I didn't know this other model behaved like this before. New mainboard in the post.. Not doing the mod again, 1366x768 on a slightly faulty IPS isn't so bad afterall! The moral of the story.. request the model number, and check it. Soldering the kit was simple, but I do a lot of small soldering at work and have a high end iron (Thermaltronics TMT-9000, would recommend it if you solder a lot), I didn't do the sense wire as I read it wasn't needed with linux (think this is with the kernel patch only? ), before reassembly I tested the screen, I didn't get any bios/grub screen, just the arch login. I added the sense wire, retested and I got the bios/grub screen and the login screen. Thanks to Nitrocaster for the board and 9R for the coreboot patch guide. After ~ 2 week delay, a new batch of eDP cables is on its way to Moscow. I will put more kits in stock once it arrives on this week. Just get my LP125WF2-SPB4 from winowin and pcb edges are already cut, is winowin watching us doing thinkpad mod ? On a second thought, I remember once I got SPB4 with precut edges, but that was a design feature, like some special revision of the display. I never saw that kind of SPB4 again. Tomorrow I'm getting the new cables and we should be back to the regular schedule with more kits in stock. Also, another X220 i7 mobo is live on eBay. Happy bidding. 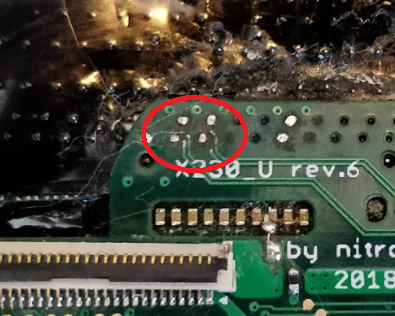 There's a new post on /r/thinkpad where the author says his new X330 came with unlocked BIOS that disables LVDS (and I guess reassigns backlight control to DisplayPort). I asked for a BIOS image and it's actually available. I'm going to try it out on my machine and let you guys know the results. If it's the patch from here, it doesn't work, it just disables, doesn't remap. It's meant for the other mods that use USB for backlight control. I get backlight but no image. Did I fry my board? Traces in this area look destroyed, which can be the reason why you have no image. You can probably reattach them with magnet wire, but that would be the last chance. I desoldered and gave up. I already spent a full day trying to get this to work. If you are not very good at soldering then do not attempt this yourself. If anyone in the EU wants to buy my screen, LP125WF2 SPB4 (win0win) let me know. I can also sell the cables if anyone needs a spare.